Rotherham town centre can now boast another national award - K.D. Davis & Sons, a family firm which dates back to 1938 at Rotherham Markets, has been named as Greengrocer of the Year at the Farm Shop & Deli Awards 2016. 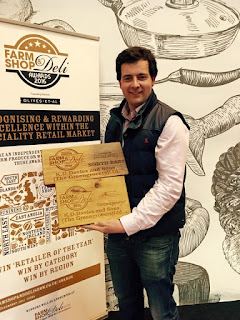 Following over 350 nationwide entries, winners of this year's awards were announced at a ceremony at the Farm Shop & Deli Show Live stage in Birmingham last week. The prestigious annual awards recognise the very best in the UK's independent, speciality retail market, celebrating the high quality produce sold and support for the local community that they trade in. Following secret shop visits earlier in the year, K.D. Davis & Sons, was first named as a regional winner before landing the title of Greengrocer of the Year. Established in 1938 by Edwin "Sonny" Davis in Rotherham Markets, the firm has moved onto its fourth generation supplying fresh produce from market stalls in Rotherham and Doncaster, as well as supplying direct to restaurants, cafes and schools, and delivering to the general public. Ryan Davis (pictured), said: "Cannot say a big enough thank you to all our customers that voted for us to become Britain's Best Greengrocer and of course to our fantastic team that made this award happen." Nigel Barden, chairman of judges and food and drink journalist/broadcaster, said: "The entries this year were outstanding – judging becomes harder every year. I think what stands out the most from the businesses we visited this year was a passion for customer service and continued innovation. There are some very driven and talented food retailers in Britain and they deserve to be recognised by awards such as these. "Engaging the local community is very important, offering a second-to-none service that loyal customers can rely on for great tasting food. We're delighted to be able to reward those who are setting such a high industry standard. The artisan food industry has experienced rapid growth of late and competition has increased, but we truly believe that the regional winners of the Farm Shop & Deli Awards are a cut above the rest. "I hope that the 2016 winners will benefit through increased press attention and footfall as a result of these awards."